I'd not been on the first three trips this term, the first trips I'd missed since January 2014(!). Given that, I knew very few of the novices and it was bewildering not to know everyone's name. It was also my first time driving the minibus, and what a rush it was! Alex had pre-bought all the food at Leamington Spa Morrisons in partial payment for membership this year (I won't bore you with the degrading filth he had to do to pay for the rest of his membership) and even though it only filled one trolley we couldn't spot anything missing. I confidently sat in the seat of the minibus working out where the indicators were, and then nervously stalled immediately. Once I got going, driving was easy and fun - it's impressive how little you need to change gear, it's either sixth or first if you're on the level. Brackenbottom and the Dump were easy to find, and we all went to bed shortly after arriving. Heavy traffic on the M42 delayed us quite a bit. This meant we only arrived at the BPC hut, the dump, at around 2am. Getting to the BPC involved going up an insane little lane almost the width of the minibus, but all was well. Other snoring visitors made it slightly difficult to get to sleep. For the first time in years, ICCC goes to Yorkshire but doesn’t stay at the NPC. Another cottage is booked, the Bradford pothole club’s HQ known by the affectionate nickname of ‘the Dump’. The drive over to Yorkshire was a slog, with roads literally on fire. We were also escorted by a police car on the M6, forcing the flow into one lane only for a good twenty minutes. The route to the Dump, in Ribblesdale took us past a BAE complex, and near towns such as Giggleswick, Gisburn and Clitheroe. Against all the odds, we did make it to Brackenbottom near 1am, found the tackle shed, unloaded the bus and slept in the Gästezimmer. Das Dump is sehr gemütlich. I came down to find Tanguy had started on breakfast, and I got stuck in with my favourite task, making eggy bread. The others filtered down, coaxed and herded by Cecilia. Quite soon we began working out who should go where. I felt I'd been excessively rude to Izzy the last time we met, so I contrived to have her on my team - what better way is there to say sorry than dragging someone into a dark hole in the ground? Ash was an obvious addition once I had Izzy, and I'd also promised James a day of hot caving based passion. Cecilia came along as a chaperone and possibly the only sane person in the group. The change at Clapham was quick and easy. I stopped to discard half of Ash's SRT gear, which was terrifying - core shot cowstails, a harness with a broken leg loop, a footloop that was hanging together by a thread. Izzy also had an experimental footloop that got replaced, and off we went. It was a glorious day, still, sunny and crisp. I quickly began to sweat, but I knew I'd want those thermals later. Ben's team were far faster than us, but kindly waited at all the decision points to make sure we found the way, and soon we were up on the limestone pavement. I'd never seen Gaping Ghyll from the top (!) so Rhys lead us over. Very impressive to see how much water is going in! We met a lady who was hiking with a laminated guide to the area, and she showed us information about past caving adventures in Gaping Ghyll. I'd been out of Bar, but never in, and the rigging was straightforwards but fun. The entrance pitch is tight so I rigged the y-hang as high as possible to make it easier to test a descender. Izzy tackled the tight entrance pitch with ease. Cecilia dropped down and I explained the Fireman's belay to her in case Ash needed it, and then Izzy and I dropped down the greasy slab. The others joined soon after and we picked out way down the boulder slope to the crawl at the bottom, pointing out geology and landmarks as we went. The second pitch is so soon, it barely seems like any distance. The rigging guide suggested a high traverse in the roof, but I saw P-bolts going down and followed them, rigging the unpleasant short rebelay to a broad ledge as best as I could before tackling the big 30 m pitch. At the bottom I watched as Izzy made her way down, slowly but confidently, and as she reached the bottom I heard the others coming down Flood. I poked my head out over the traverse to say hi and realised they were still at the top - good acoustics! The rest of my group joined me, and we rigged the traverse round Hensler's Pot to meet up with Ben, who was having a good time. As his group were still coming down, my group proceeded through the crawls to the main chamber - always a surprisingly long journey, and the pebble beds are unpleasant. I showed Ash and Izzy how to scurry, prompting Izzy to invent and sing 'Scurrying Man', a homage to my skill/weirdness. I regret not letting a novices lead the way in retrospect, it's fun having a go at following the draught. The main chamber was spectacular. I've never seen it in sunlight, and though it was already getting dark at 3, the waterfall was well illuminated. I stood near the spray as close and for as long as my fabric oversuit would allow me to, before retreating to a sand bank to ponder the awesome scale of this place. To warm up, I lead the group to a neat dig on the north side of the chamber - up a muddy boulder slope there is a set of mine cart tracks leading down into a well compacted crawl. Izzy was very enthusiastic and plunged on ahead, heedless of my calls to slow down. Eventually she got a bit stuck and decided it was time to turn back, and we rejoined the rest of our group just as Ben's group emerged. Attempting to take flash photos in the main chamber. In the main chamber Rhys tried unsuccessfully to take flash photos - both his flash and mine were having problems. I persuaded Rhys to swap with James for my team on the way out so we had a really good caver above the novices - in return I promised to derig. On the crawls back to Hensler's pot I explained deviations and hanging rebelays to Izzy and Ash, who didn't know what a krab was - time well spent. Rhys went up first, followed quickly by Ash who tackled the deviation quite well (though he required some persuasion to let go of the sling and swing backwards). Izzy and I chatted, sang Disney songs and pondered life as we waited for Cecilia to climb, and all too soon it was Izzy's turn. She started well, but quickly complained of getting tired. My attempts to cheer her up by pointing out how muscular her thighs were be after this went unheeded. At the deviation she did what I had suggest and push the krab up the rope a bit before unclipping it, but managed to go a bit too far and in an incredible move clipped the deviation krab through the top holes in her ascender! Rhys came down to help out, and although Izzy ignored his advice she did get free quite quickly, and tackled the hanging rebelay with ease. I scurried up as fast as I could (not very fast) and got to the top to find the others had gone on ahead. Packing the rope seemed to take an age, and the next pitch was rigged as a handline, which was unpleasant with a heavy tackle sack. Plunging onwards I caught up with the group just in time to pull on the rope for Izzy as she quickly ascended and then we were into the unpleasant, seemingly endless entrance (now exit) crawl. I sat in the wet drips at the base of the final pitch until Rhys eventually asked me why I was sitting in the wet drips. Again, this tough pitch seemed to have been quite easy for our novices, and we were soon on the surface. The walk down was long, but pleasant with incredible views of the night sky. Back at the hut, Tanguy's group arrived back at the same time, and I made Roast Cauliflower Pilaf with the help of many helpers. It went down well - I was told 'whatever you did to this cauliflower, keep doing it.' I didn't have the heart to tell them that the secret was an entire block of butter. Total estimated time: 1 hour - lots of work chopping veg, but then it just needs to cook for a while. Four small cauliflowers, chopped into small florets. Preheat the over to 180 C. Place the cauliflower in a roasting dish, toss in lots of oil and salt. Put in the oven and cook until slightly brown. Toss every fifteen minutes to cook evenly. Fry the onions on a medium heat in oil and salt until soft, add chillis, garlic and ginger and fry for a minute until aromatic. Add the bell peppers and cook for a few minutes until soft. Add the butter, stir till melted and increase the heat. Add the rice and cook for a few minutes until golden. Add the stock, stir on a high heat until it boils, then reduce to a simmer and cover. Add 1 tbsp of tumeric and 1 tbsp cumin, stir well and cook until the rice is soft, adding more hot water as necessary. Optional: Fry the pine nuts and raisins in butter, and add to the pilaf. No caving games were played, but Alex showed us his work with the digital elevation model for Slovenia, so we spent a profitable few hours talking utter nonsense about faults and bedding planes. This trip was, overall, an enjoyable experience, though technically difficult. We would recommend the trip to any fresher however we would strongly encourage attending more tree training sessions than we did [Ed: Izzy did one session, Ash did two sessions]. Having said this, it was interesting to note that a large amount of the technical skills involved could not be learnt in the tree training sessions and we definitely learnt a lot of new stuff on this trip which was very exciting! One of the best experiences on this trip was standing at the bottom of a massive waterfall and staring up as light and water poured in from the entrance above. This was an awe-inspiring moment which made the more tiring aspects of the caving trip worth it. The only point of concern on this trip was over Ash's kit as he had been given what was apparently faulty kit - however, this also revealed the competency of the caving members who were instructing us as Jack was able to quickly identify and swap out any potentially dangerous equipment which left us feeling in safe hands. People seemed to function on about 6 hours of sleep. Don’t know why we got up so early. I only got around 5 hours and was one of the last to get up… This meant I hardly ate any breakfast as it was all eaten. Teams were made: Rhys, me, Ryan and Carla were to exchange from Wades’ entrance (Flood) to Bar pot. I had never been to Gaping Gill and was very excited to finally see the main chamber. A slightly hidden and unsuspecting entrance opened up to a slightly right rift. Rhys rigged the pitch and Ryan and Carla competently followed down. A bit of low stooping and crawling in a rocky rift emerged to another small pitch and then another. Rhys ran out of rope and it was my turn to rig. The fourth “pitch” was described as a climb with a handline in the rigging guide; however after later discussion with the Bar team, this would be more appropriately rigged as a line you ascend upon. A small horizontal rift to the right emerged to the flood entrance main shaft. This was an impressive beast and a pleasure to rig! We were lucky with the weather; the Dales had remained relatively dry over past week and we were treated to beautiful blue skies in the morning. This meant the waterfall that I suspect would usually be a foaming torrent was far more inviting than usual. After taking a while to spot the bolts in the ceiling, I was soon off to rig the hanging rebelay halfway down the drop. On the way down I found it difficult to spot the naturals for the deviations that were described in the rigging guide. I found one bit of red tat on the opposite far wall of the shaft. After a few attempts I managed to swing all the way across and attach myself to the tat. After further inspection, I decided not to rig a deviation here. One deviation later I was at the bottom. “Eyyyoo”, Jack was at the bottom. I was amused to see his team appear just as we were descending down the main shaft. We chatted for a bit, took some pictures and Jack’s team was soon off to the main chamber. My team competently negotiated the hanging rebelay - I thought it would take them longer, I was very impressed! Getting slightly cold, on the move we were for the main chamber. The description just said to follow the draught. So that we did. Most of us had a go of following said draft, twas fun. After a bit of squeezing, crawling and stooping, we were in the main chamber! The main chamber is incredible, much bigger than I thought it would be. We were lucky enough to see the daylight piercing through. This, coupled with people’s spotlights illuminating the spray from the waterfall created an awesome atmosphere. Unfortunately we weren’t able to get the flash to work and so weren’t able to get a group photo. It was decided for Rhys to swap with James such as to provide assistance for Izzy and Ash on exiting. James, Alex, Carla and I were off. A 30m pitch followed by a very twatty ascent lead to small climb through some boulders. The inclined squeeze which followed was slightly twatty with a tackle sack, but not too bad. After the squeeze, a small ascent through a slightly tight crevice lead us to the top of Bar pot! A very satisfying trip! We decided just to have a look at Wades’ entrance - it’s not too far. After telling Ash that we were to exit via the main Ingleborough route we followed the main path, met some slackliners and eventually made our way back to the minibus. It wasn’t long before we were back at The Dump. We were all quite tired so no caving games were played. Some people geeked out over the Migovec survey. After arriving at the parking location, the crew dressed and prepped for the long awaited walk to the cave entrance. From our location it was approximately 2.5 miles to the cave entrance which encompassed steep hills along with uneven and rocky terrain. During our ascent to the entrance, we were approached by one of the locals and requested to take an alternate route (although the route was marked by "no entrance" signs (a little dodgy). The entrance to the cave was small, allowing for a few winding passageways followed by a narrow squeeze and accompanied drop decent. The remainder of the cave followed the same pattern (winding passageways and 10 to 40 meter descents ). After the last decent and a few narrow passageways, we entered a large chamber accompanied with a large and majestic waterfall. I awoke early. I had taken a grave risk and slept in the completely empty members room rather than cram in between 16 snoring others in the guest room. I decided not to risk being caught and packed my sleeping bag away to removed the evidence of my transgression. Plans were made over breakfast. Ben and I snagged the slightly more SRT experienced novices, betting on Flood being the more difficult route. We drove to and parked in the usual spot in Clapham, where we could change in full view of the children's playground and nearby church. Jack destroyed some kit to demonstrate his superiority. We were soon walking up the country lane. I was impressed by Ben and my teams ability to keep up, normally people find the walk up the hardest bit but we set a very good pace up to farm. As we crossed through the farm and got into the field we heard a whistle from behind us. The farmer was calling us back. He explained that he wanted us to walk on the other side of the woods to the way we usually go. He didn't say why, and we speculated on the walk. Flood entrance is a fairly obvious hole on the right side of the path, when walking towards Ingleborough, not far from Bar. A couple of body lengths in you find the first bolts. The first pitch is followed by a low crawl, becoming a stoop, and finally walking passage. Ducking under the wall in a damp chamber you find the second pitch. Again just a straight drop. Ben took over the rigging at this point. There's a handline climb that I think should be rigged higher up than we did it. I attempted to take some photos above the final pitch. I got some of Ryan on the first rebelay and was excited to see if I could get Carla on the second but unfortunately my flash stopped working consistently, seeming only to work when I was testing it. At the bottom we took it in turns to follow the draught. It's fairly easy, as its a howling draught indeed. Popped out into the main chamber in daylight! The water levels were low enough that it was comfortable to stand right under the hole in the ceiling (there was only one waterfall this time whereas on other occasions it seems to become 4 or 5 spread along the wall). Again attempted some photos but very little luck with either mine or Jack's flash again. The way out was smooth. I was in Jack's group this time. I barely saw Ash and Cecilia the whole way out as every time we progressed one pitch I sent them to get to the top of the next. It turns out that Ben had found a completely different deviation to the normal ones on the final pitch of Flood. It wasn't as much of a swing which worked really nicely in the dry conditions (I imagine Ben would've been motivated to find the others were it wetter). Still Izzy managed to do something mental (clip hand jammer to deviation?) and spent a little while hanging there. By the time I went down to try and help she'd freed herself. The rest of the way was smooth and we emerged into a mild clear night. The path down (the nature trail) always feels a lot longer than the way up around the side. Jack speculated that maybe there was a triangley, pythagorasy thingy going on but I've now looked at a map and that is only slightly the case. Weird. A quiet night followed, until I went to bed. Surrounded on all sides by snorers in the guest room (some members had arrived) it was not a pleasant night. Oh for the NPC and its multitude of rooms. The drive to Yorkshire was plagued with bad traffic. We reached at 1am, admired the sky (I've never seen so many stars in my entire life) and went to bed. I woke up to the sound of Cecelia's voice saying 'breakfast!' and was treated to an amazing array of French toast, bacon, baked beans, mushroom and sausage. It was really good. Tanguy, Sam, Devansh, Shaun and I headed for the Little Hull. The hour walk was upslope and tiring but the view was worth it. The group was a mixture of ice and mud which I thought was quite cool. We met hikers from Scotland who thought we’re crazy to drive all the way here. We got lost and when we finally found the place, Tanguy marked the location on his GPS with 'lul' or something like that. The entrance was small and hidden, which is probably why we missed it somehow. We started off with a lot of crawling. The wall was low and I had to crawl on my stomach, which was not particularly pleasant with many small rocks on the ground. My first time down the pitch was pretty terrifying. Being a novice, I felt my brain switching off and being unsure what to do. But thank God for the tree trainings that helped me get my hands moving when my head wasn't working, and Sam for refreshing my memory and providing reassurance. Getting past the initial fear, I admired the view as I slowly descended down this huge and beautiful pitch (I would later find out how unpleasantly tiring ascending that great height was). We helped ourselves to some freshly baked and delicious flapjacks as we took a break. Sam led the way forward through a squeezy route on the right before asking us to turn back as he hit a dead end. Surveying the grim, wet and dark path on the left, we unanimously agreed to turn back. On the way up the big pitch, Tanguy hooked on his food jammer and climbed up insanely fast with movement resembling a gecko’s. As I ascended, I spent quite awhile dangling at the rebelay attempting to hook the short cow’s tail in. Under Tanguy’s expert guidance and words of encouragement, I finally got out of that pitch. I walked forward and watched as Shaun was doing his rebelay, when suddenly something happened and he slipped a few feet down. Fortunately, he was supported by his hand jammer and long cow's tail on the next bit of rope. Unfortunately though, it was impossible for him to reach the loop and secure himself back up. Sam went down the rope to help him and went back up. Later I learned that Shaun forgot to clip on his chest jammer. Definitely a reminder for me on my next trip. Saturday morning crept upon us unseen as the Hamlet is somewhat in a shady valley, but on the horizon, the peaks of Ingleborough were gold with sunlight. 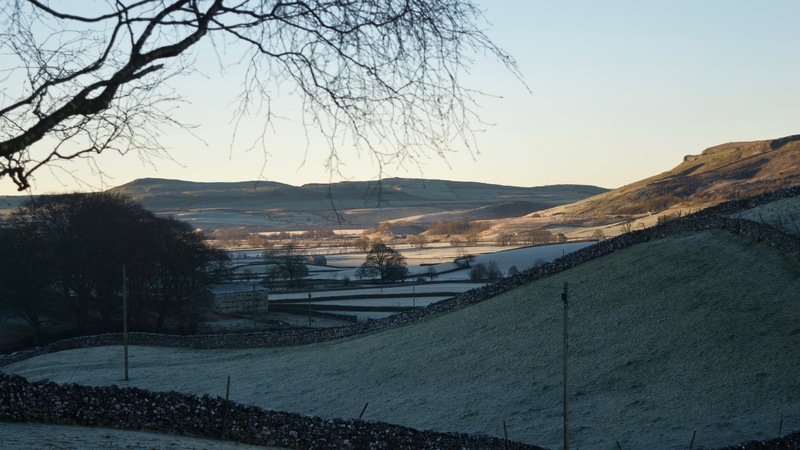 Hoarfrost on the hills, dark stone walls on a back drop of grey-green meadows and a tingling feeling on the cheeks. Morning as crisp as bacon well done. The plan as laid out by Ben was to visit Gaping Ghyll in two groups. Having been there recently, and dreading large groups in caves I set out to find a suitable alternative for a third splinter group, taking advantage of the fact that three caves if knew of were within reasonable walking distance of the cottage (there’s a fourth, but that will be for another time). I’d been to Sell Gill before and decided it was rather a Sunday cave, so I set out to convince people to join the Little Hull team. Sam, Shawn, Yan Jin and Devansh filled up the ranks. As soon as breakfast was finished there was flurry of action within the dry, warm changing room. The Gaping Ghyll team loaded the van and drove off to Clapham while the Lhullers assembled. 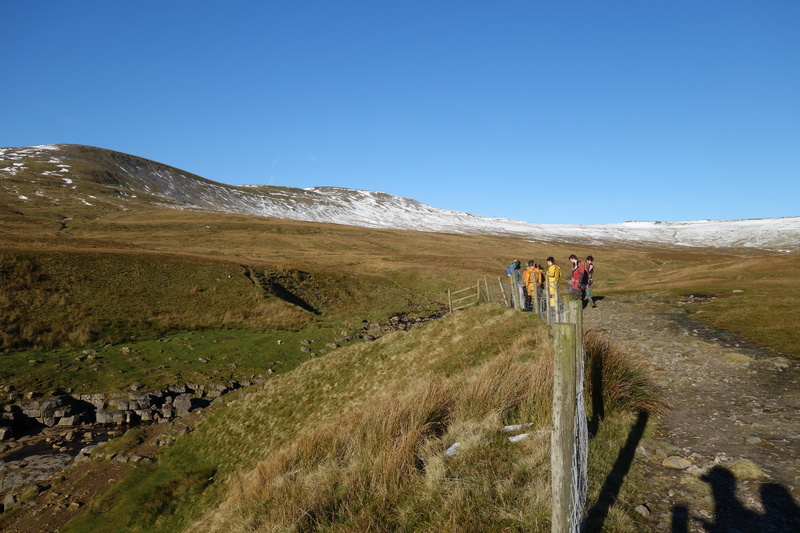 We set off on the path leading straight up to Pen-y-Ghent, climbing to the top of the limestone scar before turning north, across the foothills of the mountain. This was more arduous than I thought, but the frozen ground helped our progress. 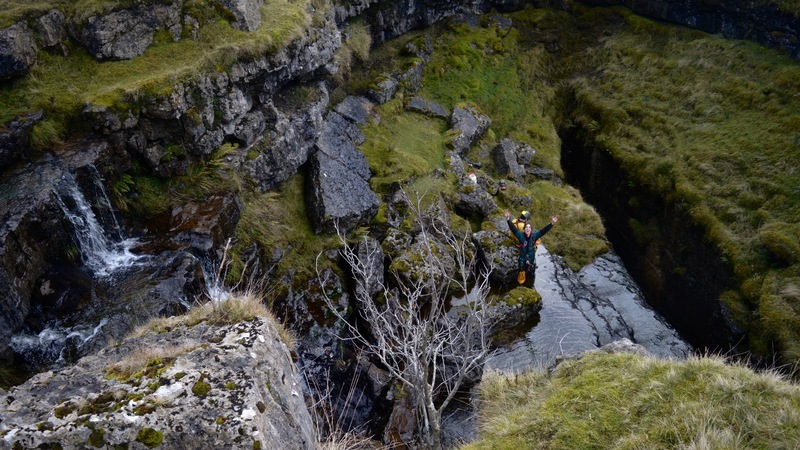 We crossed the Pen-y-Ghent pot stream, then Hunt pot’s stream and regained the Three-Peaks way. We quickly walked to the junction with the Pennine way where the description CNCC for the cave entrance picks up. Can I make a better description? It remains to be seen: from the junction, it is essential to take the Three-Peaks way west and turn upstream, cross country at the first valley crossed. It’s easy to work out whether you’ve gone too far: the turn occurs within two-three minutes of walking. The valley is dry until one reaches a stream sink: this is the entrance to Little Hull. Again, the walk is short, at around five minutes. And what an entrance this was too! A small trickle of water leading into a modestly sized streamway. This wasn’t mentioned in the description so I thought to myself “bah this is no crawl, this is a ‘stoop’ at best!”. I had spoken too soon as the ceiling naturally dropped around the next corner. What followed was a short, but not unpleasant pebbly crawl, starting flat out and gradually opening to a ‘hands and knees’ progression. The streamway resumed, and I quickly became enamoured with this part of cave, some decorations, little pools of water and a little climbing around, what better way to kick off an SRT trip than this? Shawn was hot on my heels till we reached the first pitch, the water suddenly cascading down into the darkness. Y-hang, swing into large window, rebelay, traverse on incredibly thin lip of rock, drop, 5m swing to the next rebelay, pitch free! There was a flat, spacious floor to this first drop and again I thought it was a cracking SRT cave. In 30m of descent we’d gone past a lot of different SRT situations. The rest of the cave did not disappoint. Here follows the description from the Eurospeleo website, which I naturally concur with. There was obviously no such in situ traverse rope, so I located the flowstone pillar around which I tied in a bowline, and rigged over a deep pool of water. Then I first spotted the wet descent ‘Y’-hang bolts, but looking up I spotted the ascending traverse. Climb up into the rift, past the calcited constriction over the 35m pitch: breath taking. It was a lofty precarious flowstone balcony,which induced fits of nervous laughter, was it amazing, mental or foolish? To rig the next drop was a bolt on the far wall. Step over the shaft now, then a hanging rebelay two metres down, nice! It was all very fine. I spotted the first deviation on this large hang a couple of metres below, then the other (there was already a long piece of tat) and rigged both to complete the dry descent of the pitch. It was very good. We rejoined at the bottom, ate flapajcks and descended the little cascade pitch (five metres, along the stream), which led us into the ‘virtually straight rift’. I had imagined something on the scale we’d just done. It was hoever not to be, as the passage closed down immediately, with an uninviting wet duck the only possible way on. We turned around, agreeing that if anyone was going to wait for a long time at the bottom of the large pitch, it would be best to be relatively dry. The deviations, especially the higher one proved difficult to pass for our novices, as their arm strength had been sucked up by the long ascent. Thankfully Dev retrieved the krab from the lower deviation on his way up, easing my derigging duty. After the big pitch was derigged I found Yan Jin and Dev waiting at the bottom of the first pitch, Sam at the first rebelay and Shawn on the rope above, sitting on a ledge. He was now seriously struggling with basic SRT procedure due to exhaustion. I could not really be of help underneath him, and since he was on sturdy ground, I proceeded to ascend past him and Sam with my now spare ropes. Slowly but surely, and under Sam’s encouragement he climbed up unaided and stood in the entrance streamway. Everyone else came up after him: Sam, Yan Jin and lastly Dev. I shot down to derig this pitch and found everyone back at the entrance, lying on the grass, exhausted but happy. How did this cave stay under the ICCC radar for so many years? I’d readily go back and tackle the wet crawl to go to the terminal sump! The plan was a Sell Gill wet route/dry route exchange. On the way up we caught sight of a caving group ahead of us, so we knew it might be a bit of a wait. It turned out to be DUCC with some complete novices - no criticism intended, just meant that the dry route was impassable. Rhys, Carla and I dropped down the Wet Route behind some people from the Orpheus, Rhys rigging. It was far less wet than my previous trip on Winter Tour, but I still love the dive into the bedding plane half way down one pitch. Carla handled everything with ease, even the slightly nasty short rebelay just after the initial traverse. Eventually we had to turn round becauser the Orpheus people wanted to come up. We'd left the others trying to go down the dry route when we got there, so I was pleasantly surprised to reach the surface and find Alex just coming out - great, they actually got down a couple of pitches! No, he told me - he was still waiting to descend after two hours. Ouch. As the others of that group came out, we lead them to the Wet Route streamway to have a poke about without any rope work. The Orpheus members came out, complemented our handline and had a nice chat. Good folks. We walked back, not exactly dejected because the weather was lovely, but somewhat unfulfilled. Izzy and Ash's study group was going superbly when we arrived at the hut, and Tanguy eerily arrived at the same time again, having had a far more successful trip to Hunt Pot. In short order we made large quantities of brie on crumpets and grilled cheddar on toast, packed the minibus, mopped up and sped down the country, arriving back at stores at the incredible sane time of 2215. 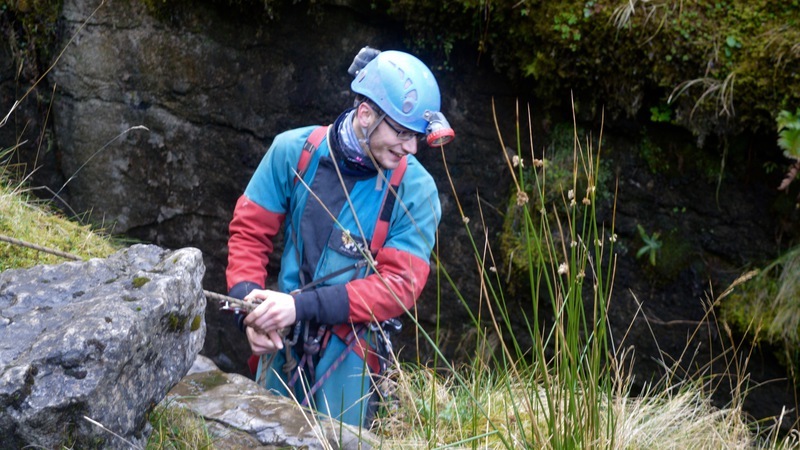 A great weekend - my highlights were seeing blue sky from the bottom of Gaping Ghyll and meeting so many of the awesome new novices we have this year. Shaun penetrates only a small way into the decidedly un-virgin depths of Sell Gill. My team decided on going to Sells’ Gill. This meant for quite a long walk through Horton in Ribblesdale and eventually on the Pennine way. After following the Pennine way for around 25 minutes we saw another group changing outside of Sells’ Gill. 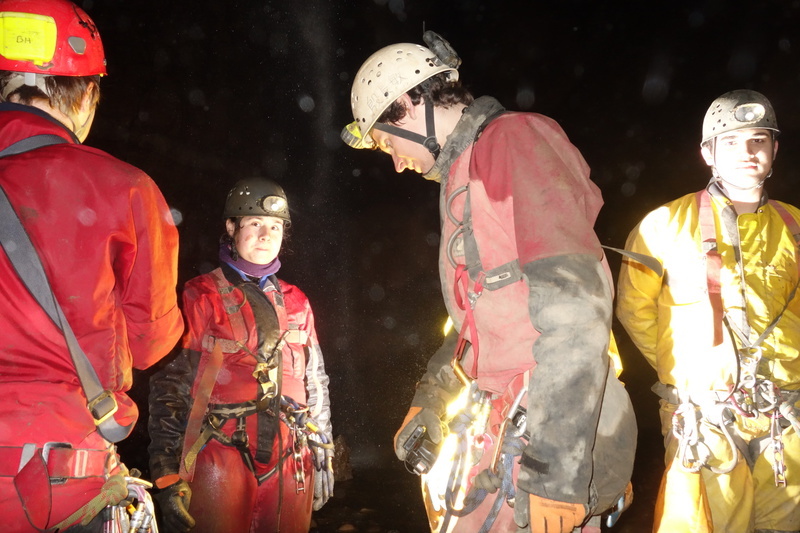 There were a group of about 15 Durham cavers on a complete novice SRT trip doing some of the pitches as SRT practise. This meant that only some of my team could descend the first pitch until we decided to go back out. We then bimbled in the short streamway following the Goblin route entrance. Slightly disappointing - but hey at least we did some caving and a nice walk. At the BPC we were met with a very enthusiastic Hunt Pot team. We packed up and off we were back to London. We left quite early at around 4pm and arrived at around 22:30. Wearing a wetsuit, however thin, for an hour walk up a hill is a terrible idea. 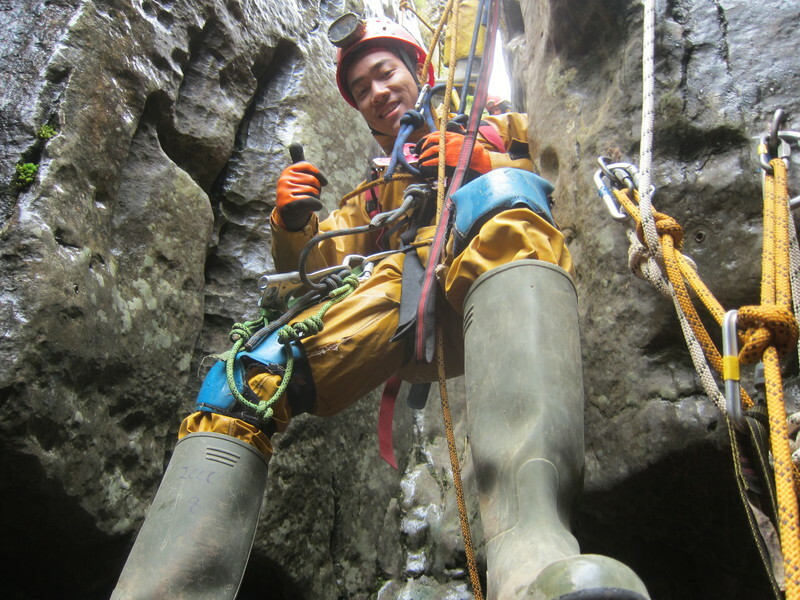 Wearing a wetsuit, however thin, for a cave without complete submersion is a terrible idea (the water level was slightly oversold). But yeh. Sell Gill wet route is lovely! I would definitely recommend it as rigging practice or novice's second/third SRT trip sort of thing. The first pitch involves a pretty mad traverse round to the left, through an old meander, and the dive into the bedding plain is fun. It's a shame we didn't get to the bottom. I saw the group of 8 people waiting in the large chamber and, concerned it was the Durham novices, decided that I didn't want to wait behind them on the way out and turned back. They turned out to be from the Orpheus and despite having a Little 'Un with them they were pretty quick on the way up behind us so perhaps it would've been fine after all. Tanguy descends into Hunt Pot. The next day, I woke up early enough to help with the breakfast. I thoroughly enjoyed taking over Jack’s job of cracking and whisking eggs, and made french toast with Ryan. Later, Tanguy, Sam, James, Ryan and I headed to the Hunt Pot. The Hunt Pot entrance was magnificently huge and filled with water. I stumbled a little and took some time doing the rebelay, but James was really nice and reassured me that it was alright. His singing was also somewhat soothing. As I descended, I took time to admire the rock formations and gigantic waterfall, bearing in mind that this was my last descent of the weekend. I got splashed in the face, my glasses were soaked and I felt disoriented without my vision. I then heard Tanguy’s voice reminding me to switch on my head lights and I slowly regained a sense of reality. We found a slightly cozy corner away from the water to keep warm while waiting. Looking down onto Hunt Pot. On the way up, I did the first re belay and waited for the next rope to be free. That took quite awhile and I was shivering in the cold with a mixture of light rain and heavy waterfall on me, feeling very thankful that I wore thermals. There is also some sense of satisfaction and happiness hanging in mid air all by myself. We all got out when the sky was still bright and took time to admire the scenery and take nice photos. We headed back with two dogs circling us (mainly James) for half the journey. We treated ourselves to crumpets with brie and toasts with cheddar before heading on a long drive back. Truly a well spent weekend away. The weather was slightly less glorious than the day before, but we managed to convince a large contingent of novices to go caving again. Two parties were assembled, Exchange and Open Shaft. The former walked off to Sell Gill, while Sam and Yan Jin joined me again to descend Hunt Pot. Ryan and James completed our group. There were no problems locating the entrance shaft to Hunt Pot, as it is a consequent stream sink. The oval shakehole is split in the middle by a dark gash where a sheet of water falls to unfathomable depths. The start of the SRT route was found across the stream, consisting of a first ‘Y’-hang drop, deviated in the middle, leading to hanging rebelay next to a spray-filled ledge. There was a second hanging rebelay further down, wetter still and draughty. The rope then landed on a narrow ledge. With two technical rebelays above, and no way to see or be heard over the roar of the water I became a little sketched out, deciding to rig an ascending traverse into a dry alcove where we could all meet up and then decide whether to turn around or carry on. This proved rather sensible, as we then emerged early. I was very impressed by our two novices SRT skills, as they managed to tackle the two hanging rebelays with relative ease. We had a quick photo session before turning our backs to Pen-y-Ghent for a last time, and walking back to Brackenbottom. 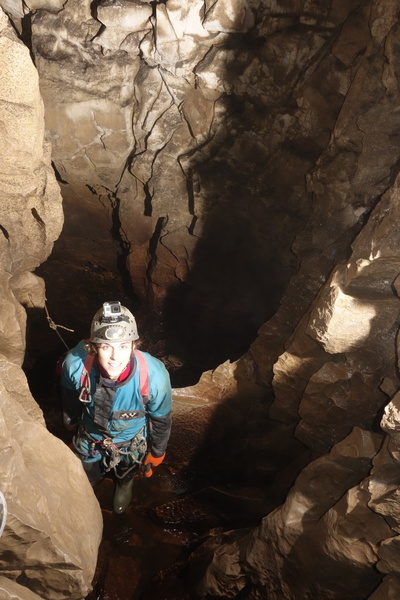 We were surprised to see the other group had arrived before us, then understood they had met other cavers going to Sell Gill, and curtailed their attempt at an exchange. On the bright side, the kit only needed to put into sacks and loaded on the bus. Toast and cheese, clean up, ‘get at the back of the VAN!’ and off we went. Excellent trip all round, I (insert appropriate adverb) love caving. 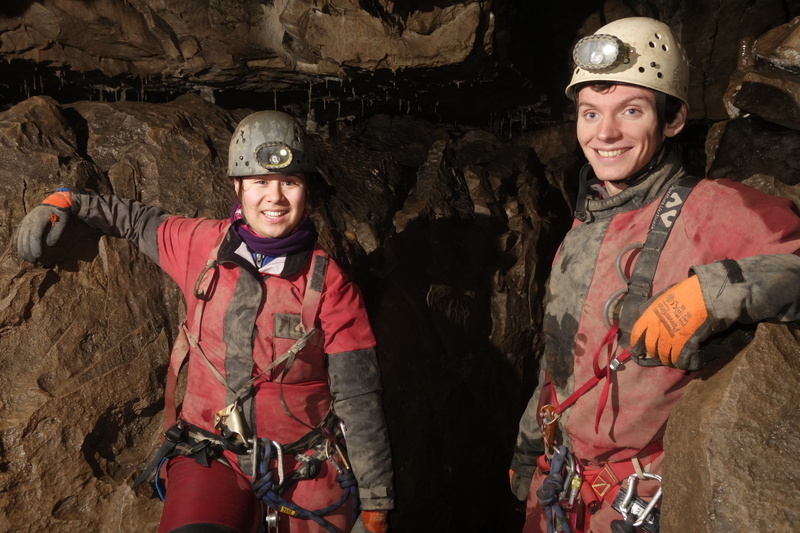 Both of us used the second day of the caving trip to catch up on university work for the upcoming week - therefore, we were able to really enjoy the first day of caving and we felt we had a great caving experience but were also able to relieve stress by having a productive day of work. The caving members were very understanding about this and we were given a large reign of freedom to make our own decisions throughout the trip. The living conditions were interesting - definitely not as comfortable as our experience on the Wales Fresher trip. The bunk beds we were staying in were quite hard and it was definitely colder (although this had a lot more to do with the fact we were in Yorkshire than the accommodation itself!) and we would strongly recommend a thick sleeping bag and thermals to any future trip-goers. The other people at the lodge were a fair amount stricter than expected but we ensured to get all the chores done that were needed and there weren't any big problems. If we were to recommend any changes to how the trip was managed, we would request more snacks. On the Wales trip, one of the caving members spoiled us by making and bringing sandwiches into the cave to ensure we kept our energy up and stayed motivated. Something similar to this would have been greatly appreciated on the Yorkshire trip! Overall, the Yorkshire trip was immensely fun, exhausting, and beautiful.